Ok guys, I'm getting you ready for your first day of school to find an interesting fact about yourself. OR - I'm preparing you with questions to help break the ice on a first date. Either way, chex it outs! And link up below! K? Q: What is your middle name? Ellen. Q: When you were a kid, what did you want to be when you grew up? I wanted to be a zoologist and race in the iditarod. Q: If you could have 3 wishes granted, what would they be? Cliche beauty pageant answer in 3...2...1. World peace. I wish for a world where all people have love, freedom, tolerance, and prosperity. You're welcome world for giving you one of my hypothetical wishes. To have more wishes. Duh! Q: If your house was on fire and you could grab only 3 things before leaving, what would they be? Q: You wouldn’t be caught dead, where? A Justin Bieber concert. Q: If you could be any cartoon character, who would you be? Definitely Ariel from the Little Mermaid. I've been singing "Part of Your World" all week! And she's super hot! Q: Who was the last person you hugged? I'm going to say my niece Ellie, but it could very well be my husband. He's always giving me free hugs. Q: What do you think of when you hear the word "yellow"? I know I write about how yellow is my favorite color, and how when I wear it, I match the sunshine. But the first thought that came into my head when I read this question, wasn't happiness or sunshine. Sadly, it was pee pee. So...I don't know what that means. Tag. You're it! Link up below with your answers to these questions! Or, just say hi! Q: What is your middle name? Q: When you were a kid, what did you want to be when you grew up? A: I wanted to be a veterinarian and a jockey. I'm too big to be a jockey at 5'4" and I came close to being vet but I traded to be a doctor. 1. I totally second your wish for world peace no matter how cliche. 2. I would wish for a couple more hours in the day so would still have time to work, see my family as much as I want, and do other activities that I enjoy. 3. Finally, I don't want any wrinkles! Q: You wouldn’t be caught dead, where? Q: If you could be any cartoon character, who would you be? Q: Who was the last person you hugged? Q: What do you think of when you hear the word "yellow"? This made me laugh! Especially the last question. :) I will definitely let you know when I fill it out! This outfit is adorable! I especially love your shoes and vest. And speaking of sunshine, I'm jealous of sun! Flagstaff has been cold and snowy and its making me miss Phoenix. I love the color yellow it's my second favorite color. YAY! Thanks for providing me with inspiration tonight! What fun answers! I like your cliche beauty pageant answers, as they'd probably be mine, too. I love the outfit, as well. 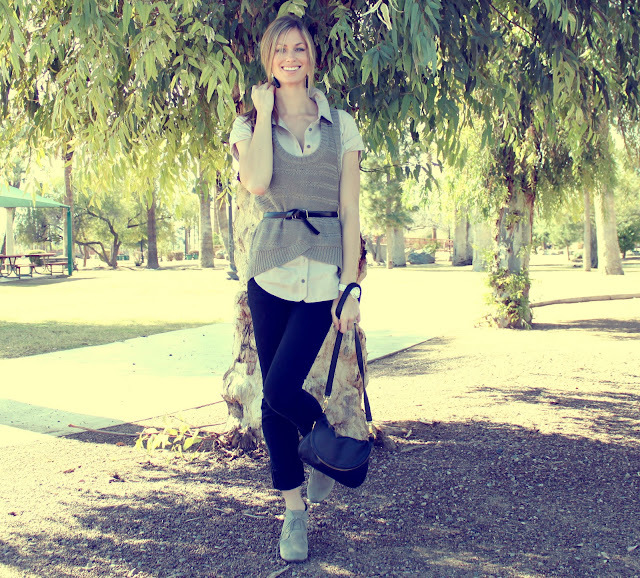 The sweater vest is chic! umm the first thing that came to my mind was the song "black and yellow." I may even like myself less for that happening like seriously! haha I wanted to race in the Iditarod too! But I wouldn't have lasted a mile! haha Justin Beiber is pretty weird! I wouldnt want to be caught there either! haha cute! I love the Iditarod!! Yeah Justin Beiber is weird! I love your vest+shirt combo. very nice! LOL your yellow comment was hilarious!!! Love the outfit! Woo hoo we have the same middle name! That's my middle name, too! I really, really love your shoes, by the way. Aren't J Brand jeans the best? They're my total fave! I love this! You are too cute! I love yellow too, except in the form of the sun :O) I live in Vegas and it makes me happy! this was so much fun! thanks! here's my a's for your q&a. it´s fun to let us know you a little bit more!! I like your pics post-processing so much!! Thanks for stopping by my page and commenting! P.S. You are really gorgeous. Loved your answers! And loved the answer you gave for 'when you think of yellow'! Funny. I wouldn't have thought of that! 4. My dog, My photo albums, my computer. 5. At some crazy once yearly sale... i get anxiety just thinking about it! 8. Coldplay! Love that song! I cannot believe you said Ariel... After I saw that movie as a child I went through a phase where I refused to respond to anything BUT Ariel. Ive never met someone who shares my love for the Princess of the deep blue sea, but I am so glad you appreciate her unending beauty too. And Prince Eric--SO underrated. My long-standing French love affair with Essie continues on. I got my paws on Turqouise and Caicos and I am in LOVE. I think Ariel would love this color. Lastly, may I request that you post a how-to for that cute little flippy-do that you do with your belt? A-dorable. That vest is so cute!